More fish sauce, please. | AYAH! 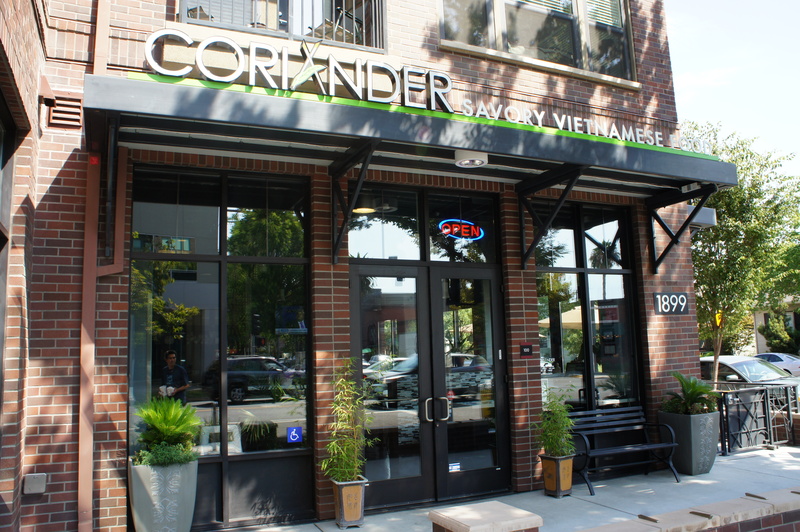 You may have seen Coriander, a Vietnamese restaurant on the corner of Alhambra Blvd. and S St. in East Sacramento. It’s refined, sleek, modern and upscale. In other words — everything that I’m not used to seeing at an Asian restaurant. I wasn’t expecting to taste South Sacramento’s Stockton Boulevard at this restaurant. But I was really hoping I would. The staff made it feel very inviting as soon as we walked in. The decoration and artwork are just right, if not a little rigid. 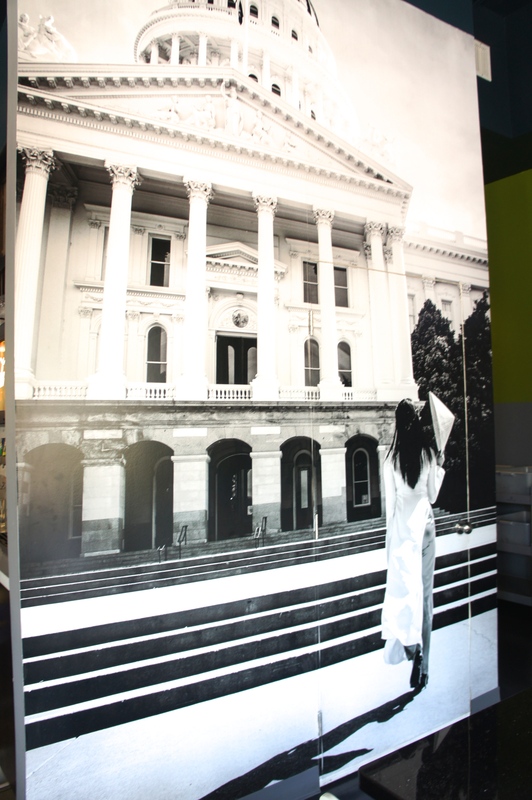 I was especially impressed by the floor-to-ceiling length photo of the woman in Vietnamese dress, with her back to the camera, standing on the west steps of the State Capitol. The counter tops were shiny and new, the customers; young and hip. 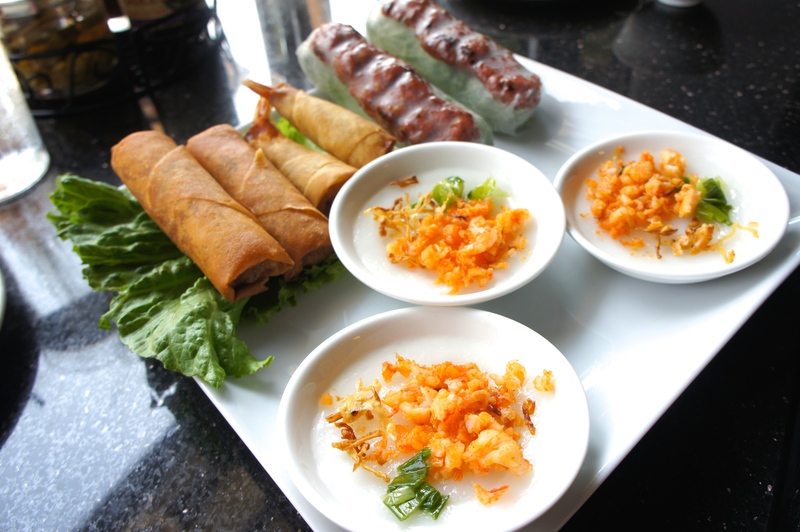 We looked at the menu, and saw some familiar items: Saigon Crepes turned out to be Bahn Xeo appetizers. Banh Beo were the steamed rice cakes in cups, topped with dried shrimp. Bun Thit Nuong is the cold noodle dish topped with pork, shrimp, and fresh herbs, then doused with fish sauce vinaigrette. 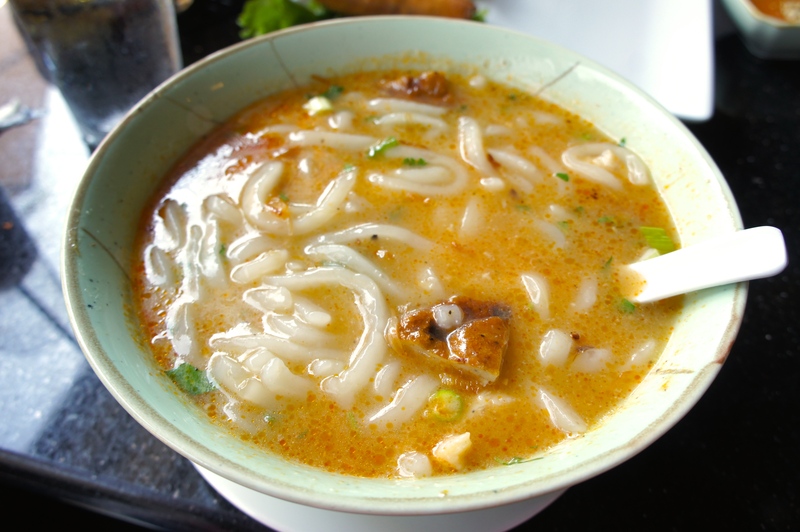 I ordered the Seafood Bahn Cahn, a soup of seafood and noodles, filled with flavorful broth. All of it was good, fresh and characteristically beautiful Vietnamese cuisine. We were eating with an open mind, but I soon found out — it was lacking. It wasn’t grabbing me because I already knew, this is definitely not what Auntie is cooking at home. Where were all the meat odds and ends? Where were all the funky smells? I felt like I was a guest in a stranger’s beautiful home, making sure to offer polite comments about the appetizers, and being conscious of not leaving a water ring on the coffee table. I just didn’t feel comfortable… food comfortable. It’s not the kind of place that I would want to make a mess, not that I would. I just want it to feel OK for me to do so. This wasn’t like going home and eating with my family; all elbows, odd chairs, mismatched napkins, plates and silverware. That’s why I’ve found places on Stockton Boulevard so inviting. No one cares if you’re loud, drunk, messy. Do you like your food? OK, then that’s all that matters. I can’t eat right unless I feel that. The food didn’t up make for the loss of atmosphere either; the flavors weren’t as bright, bold and unapologetically in-your-face as other Vietnamese food I’ve eaten. 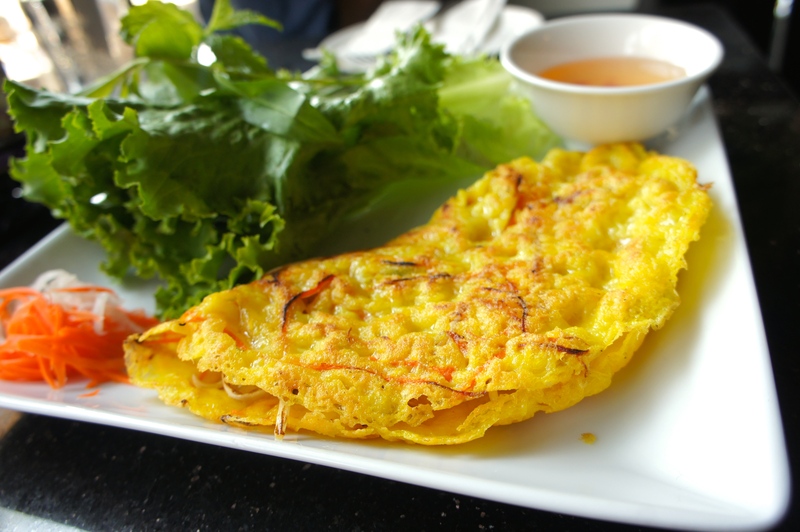 The Saigon Crepes needed more seasoning. The Bahn Cahn would have been better without Udon noodles, which didn’t soak up the broth, but rather slid off of it like, well, a wet noodle. 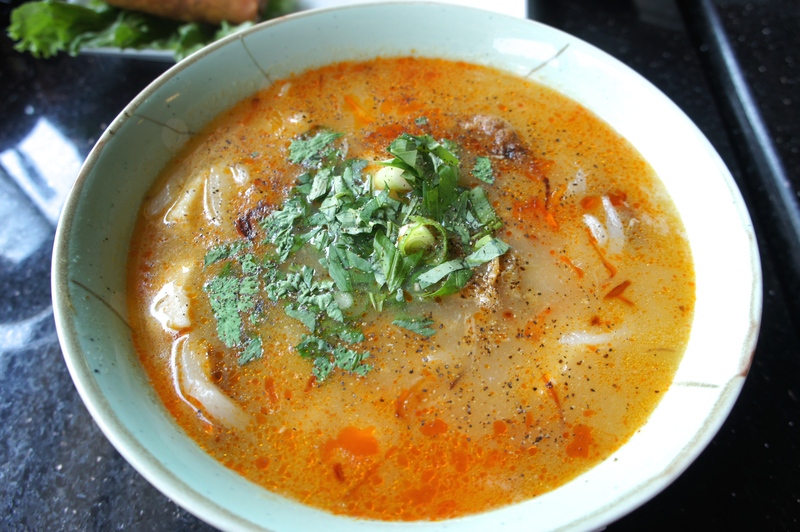 Hint: ask for the Pho noodles if you’re getting this dish. So, who’s running this? I talked with the server who informed me that this is a Vietnamese family-owned business, run by a restauranteur who wanted to open a spot that serves food from his own culture. The problem is, they’re not. 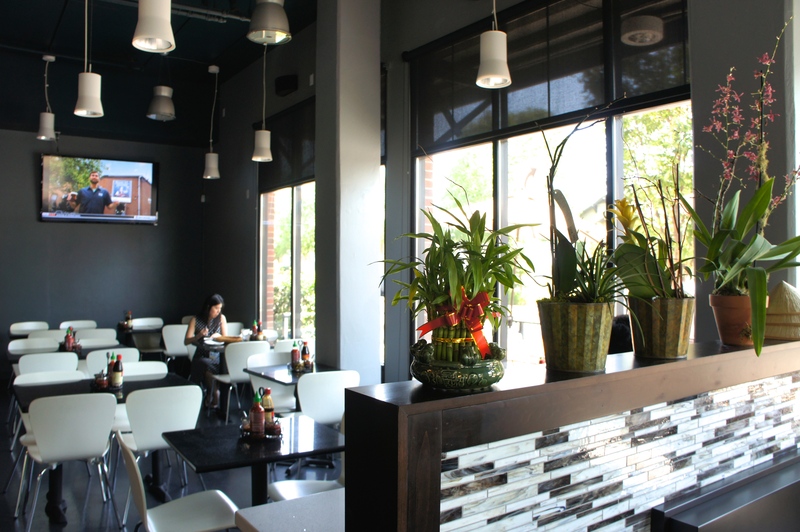 They wanted to translate South Sacramento Vietnamese cuisine to East Sacramento. So, they modified the menu to fit the perceived audience. That meant more vegetarian friendly options, non-offensive ingredients, and just a taste of fish sauce. Well, I say to Coriander, ‘more fish sauce, please’. It’s not too late. Let them hold their noses! Stink up the place! Ferment, ferment, ferment! Because you know, the people who really want to eat your food are going to stick around, and maybe even come back. Sacramento Got Some Asian Flava, OK?! ?